AEDAC Press Conference with special guest, Senator Richard Blumenthal! 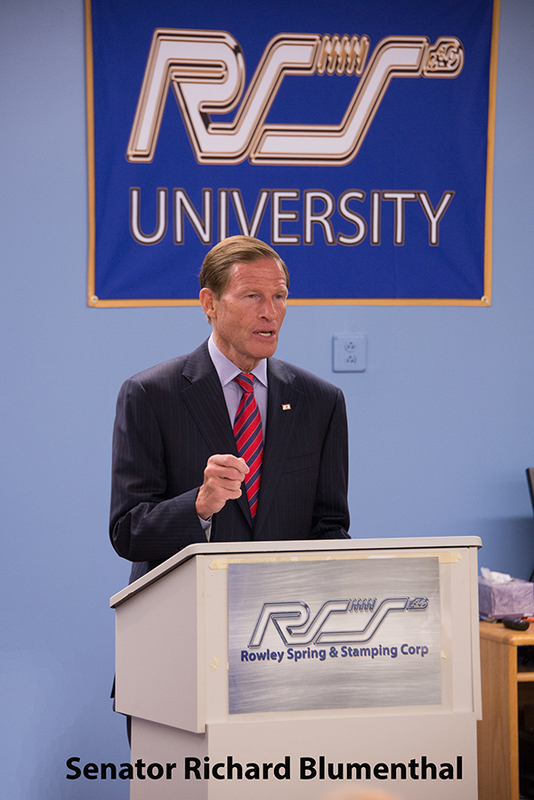 | Rowley Spring and Stamping Corp.
← Rowley Invests in Local Labor Force in a New Way. AEDAC Press Conference with special guest, Senator Richard Blumenthal! 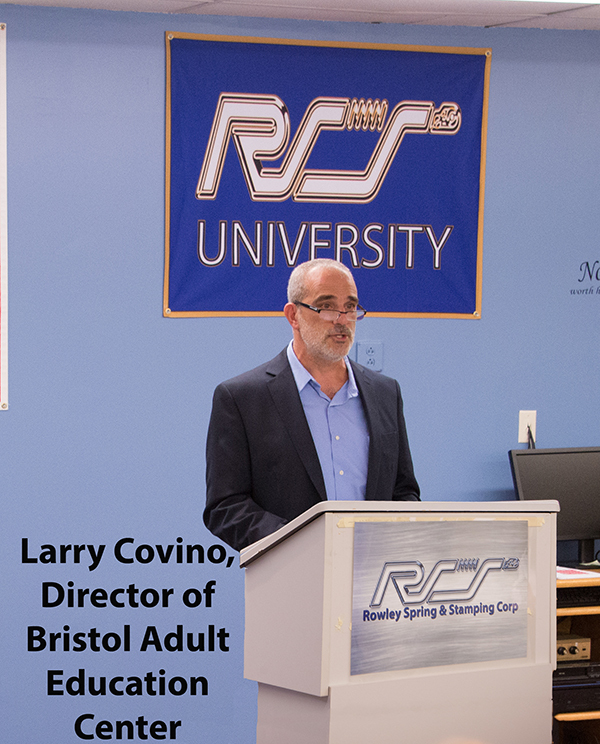 The conference was held to discuss the pilot program that Rowley Spring and Stamping (RSS) is working on in junction with AEDAC and Bristol Adult Education Center (BAEC) to provide participants to get their GED and train them for a career in manufacturing. The collaboration between BAEC and RSS allows for a unique learning experience to receive hand-on training on Rowley’s manufacturing floor while receiving classroom knowledge simultaneously. This unique setup is to inspire people in the community that have may not be able to afford to go back to college and currently looking for new career opportunities. The program is made up of three main components: GED Prep, manufacturing competencies lecture, and hands on training at Rowley Spring and Stamping. The program estimated costs were around $85,000, which has been funded entirely through private donors. Representatives from the Dollar General Foundation, the Central CT Chambers of Commerce, the Main Street Community Foundation and the New England Spring and Metal stamping Association were also present during the conference. The Bristol Board of Education, the Central CT Chambers of Commerce, the Main Street Community Foundation and NESMA are the key partners that have collaborated to promote and support the AEDAC program as well as establish the Bristol Technical Advisory Board. Wal-Mart and the Farmington Bank Community Foundation are also supporters. The program is a risk for both the Adult Board of Ed and Rowley Spring but if the program is success then it will be a risk that was well worth the effort. It will help out the people looking for jobs that lack the skills needed for manufacturing as well as help manufacturing stay on American soil and continue to reach the demand of the market. Any adult interested in applying for the AEDAC program contact the BEAC at (860) 584-7865.